This year HelenOS, an operating system based on a multiserver microkernel design originating from Charles University, Prague, had the privilege of becoming a mentoring organization in the Google Summer of Code program. Our preparation began a couple of months before mentoring organizations started submitting their applications, but the real fun hit us when we were accepted as a mentoring organization and when the students started sending us their project proposals. We put together about a dozen ideas for student projects and received about twenty or so official proposals. HelenOS had three mentors and we were thrilled to be given three student slots for our first year in the program. During the student application period we received a lot of patches from candidate students determined to prove their motivation and ability to work with us. It was no coincidence that the three students we chose submitted some of the most interesting patches and did the most thorough research. Two students sent us enough material to seriously attack the first milestones of their respective projects and the third student fixed several bugs, one of them on the MIPS architecture. The three selected students were Petr Koupy, Oleg Romanenko and Jiri Zarevucky. Petr and Jiri worked on related projects focused on delivering parts of the C compiler toolchain to HelenOS while also improving our C library and improving compatibility with C and POSIX standards. Oleg chose to further extend our FAT file system server by implementing support for FAT12, FAT32, long file name extension and initial support for the exFAT file system. When the community bonding period began and we started regular communication with our students, all three mentors, Martin Decky, Jiri Svoboda and Jakub Jermar, noticed an interesting phenomenon. Our students seemed a little shy at first, preferring one-on-one communication with their mentor, as opposed to more open communication on the mailing list. This bore some signs of the students expecting the same kind of interaction a student receives while working on a school project with a single supervisor and evaluator. Even though not entirely unexpected, this was not exactly how we intended for the students to communicate with the HelenOS team but we eventually managed to change this trend. In short, all three of our students were pretty much technically trouble-free and met their mid-term and final milestones securely. To our relief, this was thanks to the students’ skills rather than projects being too easy. Two of our students were geographically close to their mentors so Jiri and Petr attended one or two regular HelenOS onsite project meetings held in Prague. Besides the regular monthly team meetings, the HelenOS developers met for an annual coding week event called HelenOS Camp. This year the camp took place during the last coding week of the program and we were excited that one of our Google Summer of Code students, Petr Koupy, was able to join us for the event and hack with the rest of the HelenOS team. Shortly after Google Summer of Code ended we merged contributions of all three students to our development branch, making their work part of the future HelenOS 0.5.0 release. 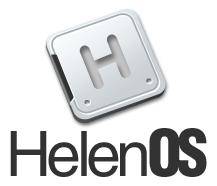 Below is a screencast showing HelenOS in its brand new role of a development platform, courtesy of Petr Koupy.